PHUKET: Patong Mayor Chalermluck Kebsup yesterday (Mar 5) signed the formal contact hiring joint-venture I.M.P Consortium to install the power lines and communications cables, including a fibre-optic main, underground along three kilometres of the Patong beach road. 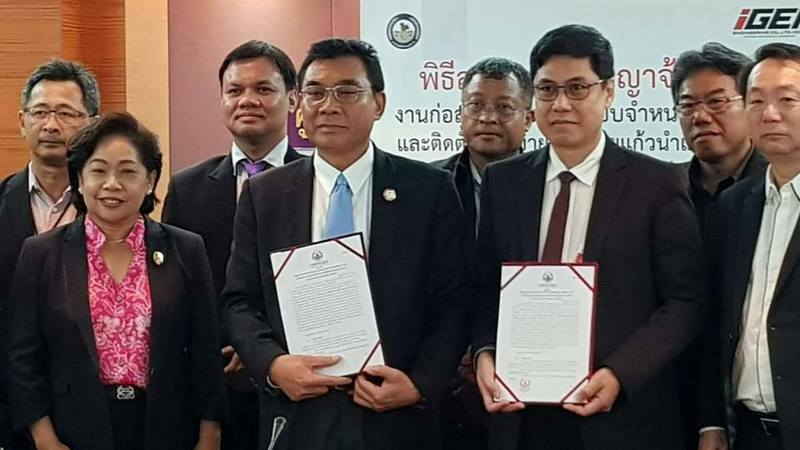 Under the contract, signed at the Provincial Electricity Authority (PEA) head office in Bangkok, I.M.P Consortium is to be paid B228 million to carry out the work. The contract start date was yesterday (Mar 5), with I.M.P Consortium given one year to complete the work, from the Pak Bang Canal at the southern end of the beach to Haad Patong Rd near Loma Park. “The construction will take one year, starting Mar 5, 2019 and it must be completed by Mar 5, 2020,” Mayor Chalermluck told The Phuket News. “After this contract signing, Patong Municipality, the Provincial Electricity Authority and I.M.P Consortium will have to talk about the guidelines for the operation. There must be public announcements for people to know that the work is about to commence,” Mayor Chalermluck explained. “We will invite business operators and people who live in the area to talk about how the staff will work. We need their opinions and to know whether they have any concerns about this project so that we can find a way to minimise the inconvenience for them," she said. Was all this stuff at Patong Beach Road not already done a few years ago?